whimsical_brush says: I love the fine details, beautiful! heatherdutton says: :) Thanks so much Connie! sewconnie says: What a lovely design! 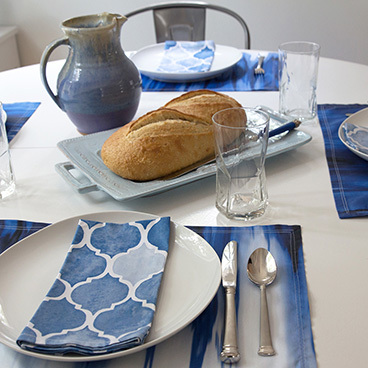 mktextile says: I just think your artwork in this collection is so beautiful. I'm a big fan! 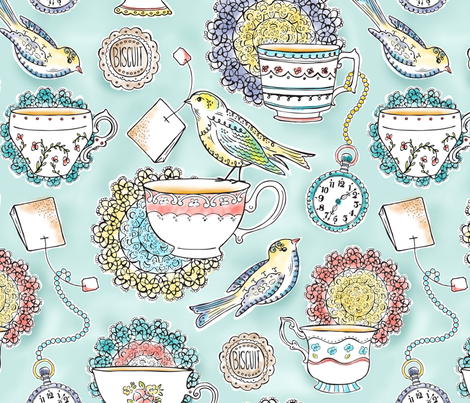 magentarosedesigns says: Gorgeous soft and sweet artwork Heather and such a brilliant versatile design! heatherdutton says: :D Thanks so much for the sweet compliment Catia!! catialee says: This is amazing! I love the softness of the colors and the delicate details. BRAVO! winterblossom says: Very pretty indeed. Lovely colour palette. heatherdutton says: :D Wee!!! Thanks so much Nancie!!!! nancierowejanitz says: I just LOVE LOVE LOVE this!! heatherdutton says: :) Thanks so much for the great feedback Michiela & captiveinflorida!! captiveinflorida says: I commented a while ago but I saw this again...and just have to say once more how much I looooove this. It is so special! heatherdutton says: :) Thanks so much Mary!! nola_original says: I love this design!! heatherdutton says: Thanks so much Erick!!! heatherdutton says: That is the sweetest compliment :) Thanks so much Alex! studioalex says: So, so pretty, it feels like a song! heatherdutton says: :) Thanks so much Lisa! lisa_cat says: I love this design, beautiful. celandine says: Utterly charming from start to finish! One of the prettiest things I've found on here so far. heatherdutton says: What an incredibly generous & sweet compliment!! Thanks so much Tara :) ! taramcgowan says: Your collection is so elegant! You have all this detail yet it's not busy it's actually calming! How do you do that?!! :-) Your designs are classy! Love your work! heatherdutton says: :) Thanks so much for the sweet comment Grace! gracedesign says: Congrats, Heather! Your beautiful collection is one of my favorites. I love your adorable birds & all the pretty details! heatherdutton says: :) Thanks so much Amy, Mandy, Sara, Allison & Inna!! sara_berrenson says: Thanks for your sweet comments Heather! I love your collection... every fabric works so well together and I love all the cute details you've integrated into all of them. 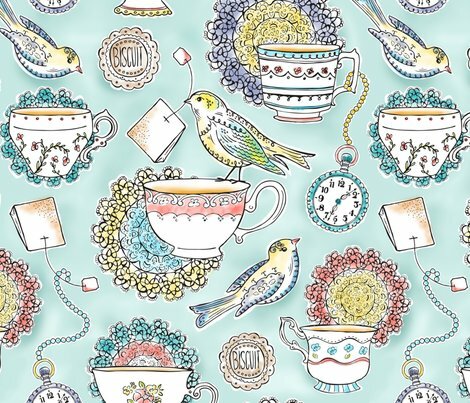 Especially love the tea tins and the spoons, and the lace patterns on the bird's wings! valley_designs says: Thank your for comments Heather. Your collection is an inspiration..... I will look back at your collection. 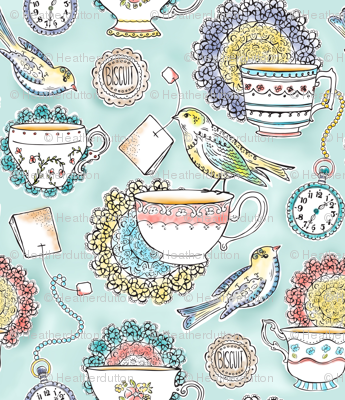 I love the little bird perched on the tea cup, so sweet. snowflower says: Heather, your collection is beautiful. I don't know how you made it look like watercolor without actually painting it but you did an amazing job keeping in the spirit of the watercolor medium. lucindawei says: Congratulations on making it to the top 8! Your collection is wonderful. angelastevens says: These are so delicate and delightful, love them! ottomanbrim says: Good luck. This collection is so wonderful! 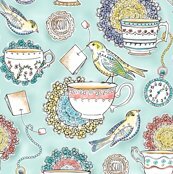 donnamarie says: Love your Tea Time Designs. kezia says: Stunning collection.. I love your illustrations.. Good luck! erika_ees says: I voted in your collection! ItÂ´s so beautiful! I have to confess I was in doubt between four collections...Congratulations and I hope you win! dinorahaleatelier says: Congratulations, I Love the beautiful details and soft colors on your collection. kimnb says: You have really outdone yourself with this collection. I love vintage items! The collection honors the past in a totally modern, whimsical way. Fantastic work! alicia_vance says: wow, amazing collection Heather! tallulahdahling says: So charming! Congratulations on making the finals! heatherdutton says: Great idea Sue!!! I can't mess with the files before the vote next week but that's definitely something to think about doing later on :) Thanks! fireflower says: Like the artist who hid "Nina" in his paintings, perhaps you could put some small indication of your ownership , hidden within your designs. It would move along with a "pinned" picture, and need only be changed if you had to make it public in order to prove theft. karenharveycox says: P.S. Don't forget to put your copyright emblem on these fabrics, in case someone pins them to Pinterest. karenharveycox says: Heather, this collection is gorgeous. How generous to share it with us too. Wishing you the best of luck. heatherdutton says: My Fabric8 collection is finally done! Woo Hoo!! Or should I say... Tweet Tweet! Ha! Ha! heatherdutton says: :) Blush.......You are SOOOOO sweet!! Thanks so much Nancy!! 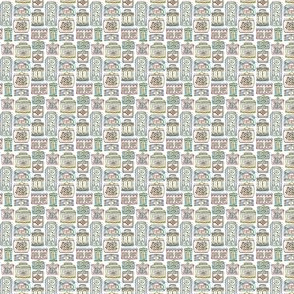 verycherry says: I'm so happy for you, you must be one of the most positive persons here on spoonflower!!! heatherdutton says: :) Thanks so much Angela!! I'm having fun finishing up the collection & can't wait to share it! angelastevens says: Best of Luck! Can't wait to see the new collection - love this design! It has so many wonderful elements. heatherdutton says: :) Thanks so much Lauren & pinpsodapop!!! laurendahl says: Absolutely stunning! I am impressed by your decision to move forward with the contest even though you didn't feel super confident with watercolor. You hit it out of the park! heatherdutton says: Blush... ;) Thanks so much Lucie!!! I could totally say the same to you! HUGE congrats and have fun designing the rest of your collection :) I can't wait to see what you come up with! snowflower says: Congratulations Heather! I am a big fan of your work. I feel so flattered to be up there with you. Woohoo! Can't wait to see your collection! heatherdutton says: :) Thanks so much Ann, Natasha, Kate & Amy!!! pennycandy says: Congrats on making the Top 8, Heather! Well-deserved for such an incredible design! Good luck in the next round! kate_legge says: Congratulations on your design. Good luck! natasha_k_ says: Congratulations! can't wait to see what you come up with for the collection! This is sooo beautiful!!! 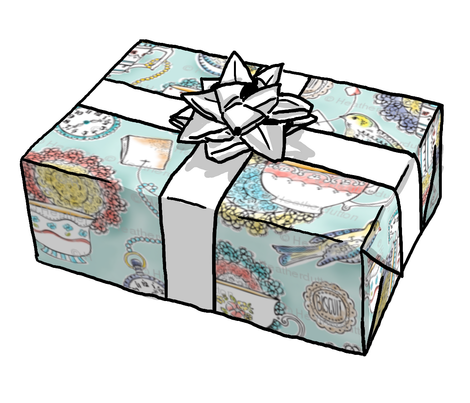 createdgift says: Lovely design Heather, Congratulations! gracedesign says: Huge congrats, Heather! Really beautiful design! I look forward to seeing your collection. inscribed_here says: Congrats on making it to the final round, Heather! susan_polston says: So well-deserved. It's a pleasure not only to see a great design, but obviously you put in a lot of work! innaogando says: Congratulation! ItÂ´s beautiful! nicoletamarin says: Congratulations Heather! A front runner from the start, can't wait to see the coordinates! Best of Luck! 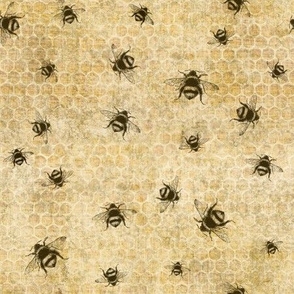 bee&lotus says: Well done Heather!! so good to see your design was selected :) All the best for the final. meliszawang says: Congratulations, all the best! ravenous says: Congratulations on making the finals! holly_helgeson says: Congratulations Heather! Your design is devine! So very unique and lovely! Good luck! cjldesigns says: Congratulations Heather! So happy to see you in the final 8, looking forward to seeing your collection. Best of luck! brainsarepretty says: I can't wait to see your collection! eppiepeppercorn says: Beautiful work, congratulations! wildnotions says: Congrats and good luck! cheyanne_sammons says: Congratulations on the top 8 Heather!! You deserve it. I can't wait to see the rest of your collection. heatherdutton says: I'm having a little giveaway to say thanks for all your support & votes in the Fabric8 competition!! I couldn't have gotten here without you guys! Check out the link on my Flickr page & Good luck :) Weee! zoebrench says: Yeah! My wacom is saved! ;-) Well done! Can't wait to see the collection and good luck with it all. kayajoy says: Big congrats Heather! So well deserved. robyriker says: Congratulations!! Can't wait to see your collection!!! Good luck! cksstudio80 says: Congratulations! I love your design! jodielee says: I'm new to Pinterest. How do I add this to my favs? jodielee says: Just gorgeous Heather!!! I want to get some of this one. It's so, so pretty!! marie_s says: Congratulations! SO exciting for you! pattysloniger says: Yay!! Big congrats Heather, it's well deserved! nekanen_designs says: This was one of my favourites! I'm very happy for you! Congratulations! kristopherk says: Love this design - congratulations! spellstone says: Well done Heather!! lucindawei says: Congratulations! One of my favorites! leventetladiscorde says: Bravo !!! Congratulations !! rhondadesigns says: Congratulations, Heather! 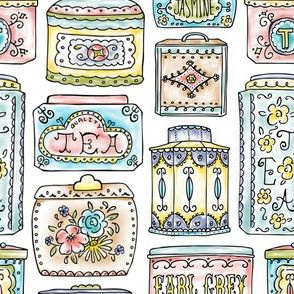 Your design is such a sweet and quirky tea-time treat! amel24 says: Yay! Congratulations on your very well deserved place in the final 8! zesti says: Woohoo! There was no doubt in my mind that you would be one of the finalists, Heather! Congratulations!! heatherdutton says: Terese... you made my morning with your unbelievably sweet comment! Seriously... Thanks so much :) Your "My Retro Kitchen" design is fantastic!!! I can't believe this is the first contest you've entered! You should definitely be entering more of them... your designs are fab! mktextile says: this is so lovely and charming! heatherdutton says: Wow! Thank you guys so much for all of the sweet comments & congrats. I feel really lucky to have made it into the semi-finals with so many other amazing designs & it makes me giddy that you guys like what I came up with :) Wee! youngcaptive says: one of my favourites in the top 100! so cute. khowardquilts says: There is most definitely no other design like this in the contest. cheekytree says: Congratulations Heather! 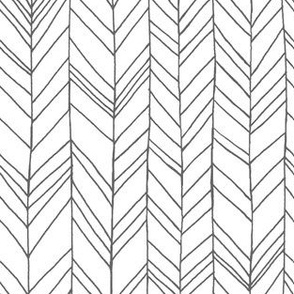 I love this pattern - just posted it to my Spoonflower board on Pinterest. 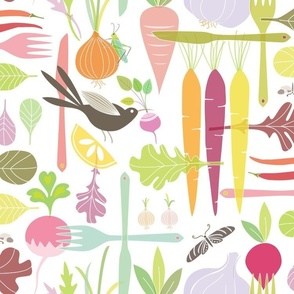 http://pinterest.com/cheekytree/i-spoonflower-fabrics/ Best of luck in the contest! leventetladiscorde says: Congratulations and good luck!!! innaogando says: This is the best of this challenge for me. Beautiful! heatherdutton says: Thanks so much Isabella, Patty, Kathleen, Nikki, Lori, Holly, Faratiana, Julie, Zoe, Kathleen & Allison :) Your sweet comments & congrats put the biggest smile on my face this morning! zoebrench says: Best of luck with the competition! It's such a beautiful design! cjldesigns says: Best of luck Heather! Your design is wonderful! 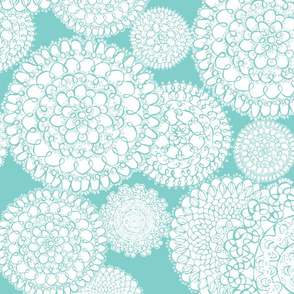 holly_helgeson says: I love all of the delicate detail in your design! Very pretty! Congrats on making the semifinals! Best of luck!! retrorudolphs says: Love it!! Good luck in the final round of voting! nikky says: Very well done! pattysloniger says: ooh Heather, this is wonderful, this style suits you too! inscribed_here says: This delightful design is full of charming details, Heather. I love the scrolled handles on the ornate teacups! cheyanne_sammons says: This is so pretty Heather! I wish you the best of luck in the contest. cherryandcinnamon says: Very pretty, like modern Victorian. Good luck! rhondadesigns says: This is a charming, nostalgic reminder of times past presented in a very modern format! The dainty patterns on the delicate china cups remind me of the afternoon tea parties my mother had when I was a child. Her guests may not have been feathered but they did seem quite chirpy! allisonbeilkedesigns says: this is absolutely dahling! retrorudolphs says: Such a pretty design! Good luck in the contest! irrimiri says: Wow this is soooo good! You know that this would also look great as a wallpaper no doubt. Birds having tea :D - Good luck in the contest! joanmclemore says: The entire design is fun, but it great the way the bird with the teabag still can be spotted from among the elements. Very sweet. madex says: Beautiful, lovely detail! mariao says: so lovely romantic! nekanen_designs says: Gorgeous! Great job! bussybuffu says: This is lovely! Good luck! zesti says: This is so pretty, Heather! Love the theme and the dreamy colours! kezia says: I love this! So vintage and pretty! glimmericks says: Such a rich and interesting design. It has so much to choose from for making coordinates, too. There are so many great choices for this contest and most designers really pulled out all the stops. I do not envy the judges. cjldesigns says: So beautiful! Good luck in the contest. angelastevens says: Very dreamy! Fantastic! heatherdutton says: Thanks SOOOOO much for all of the amazing comments and design love you guys :) I'm seriously all smiles right now!! karenharveycox says: How clever. What an original idea. victorialasher says: This is lovely. So many options to make coordinates. kayajoy says: So pretty! I can just start to imagine the co-ordinates. Nice job, Heather! domesticate says: This lovely, Heather!! Best of luck!! nicoletamarin says: This is delicate and beautiful, and wonderfully executed. I love the victorian feel. Best of Luck! sammyk says: Simply stunning, Heather. STUNNING!!!! elenarial says: I really like it, congrats and good luck! peagreengirl says: Your soft colors and darling drawings really grab my heart!!! Love this !